This door and the one pictured top right, are nice examples of a Dutch door with windows in the top door. 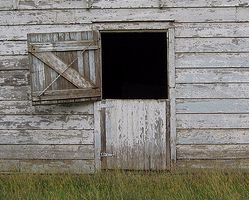 The original Dutch doors did not have windows and looked more like the stable door shown to the right. A Dutch is a door that is divided in two horizontally so that either part can be left open or closed. The two doors can also be locked or latched together so they can be opened and closed as a single door. The two doors, top and bottom, are mounted in a single door frame with each section having two hinges. As the name already indicates this type of door originated in the Netherlands in the late 1500s. Originally it was used strictly for homes on or close to farms. The design of the Dutch door allowed the top section to be opened to let light and fresh air in while at the same time the closed lower section would keep out wandering fowl and other loose running farm animals. Prior to being used for homes Dutch doors may have been used in stables. The farmer would be able to feed the horse or other farm animals through the opened top section while the closed lower section would keep the animal inside. Dutch doors are also known as stable doors in the UK. Even though Dutch doors have been around for ages they are still used today in stables and in increasingly numbers in residential settings. Dutch doors can be used for outbuildings such as garden or tool sheds, workshops or even cabanas. In these settings Dutch doors can create a rustic or country style feeling. 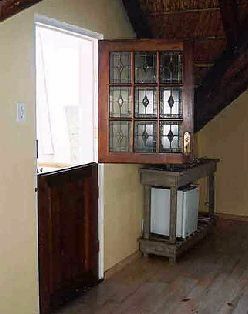 Originally, Dutch doors for residential use, as described above, had no windows. However, today's Dutch doors often have a window or windows for the top section. Personally I like the solid bottom, window top combination. Dutch doors at a bed and breakfast place called Gables Country House. in East Cintsa, South Africa. Photo Credit: Conspiracy of Happiness.